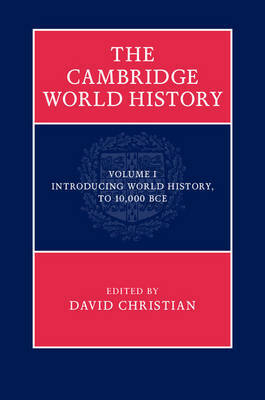 Volume 1 of the Cambridge World History is an introduction to both the discipline of world history and the earliest phases of world history up to 10,000 BCE. In Part I leading scholars outline the approaches, methods, and themes that have shaped and defined world history scholarship across the world and right up to the present day. Chapters examine the historiographical development of the field globally, periodisation, divergence and convergence, belief and knowledge, technology and innovation, family, gender, anthropology, migration, and fire. Part II surveys the vast Palaeolithic era, which laid the foundations for human history, concentrating on the most recent phases of hominin evolution, the rise of Homo sapiens and the very earliest human societies through to the end of the last ice age. Anthropologists, archaeologists, historical linguists and historians examine climate and tools, language, and culture, as well as offering regional perspectives from across the world.